The League of Women Voters of Great Bend is a grassroots organization advocating for informed and engaged voters. 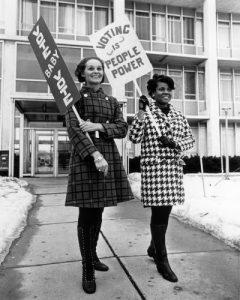 All citizens of voting age, both men and women, are welcome to join as members. League member Janice Walker and president Rebecca Dudrey explain the League’s position on this important federal house bill. HR1 ensures citizens’ right to cast his or her vote and advocates for the overturn of the Supreme Court’s decision on Citizen’s United v FEC that established corporations as having the same rights as people in campaign contributions. Read the article at the Great Bend Tribune. If any of these issues appeal to you, we would love to have you join LWV of Great Bend today! Sharon Ailslieger, Intra-League Coordinator for the LWV of Kansas will present the program. She will discuss how the different local Leagues of Kansas function and learn about the Great Bend LWV. She is very knowledgeable about both the state League and the local Leagues. . She will also accept questions from those attending. Come and join us and learn about the different local Leagues of Kansas. LWV of Great Bend hosts regular meetings on the second Tuesday of each month at noon. Meeting are held at The Walnut Bowl in Great Bend. Our meetings are free to attend and open to the public. Membership is not required to join us! ERA, the Equal Rights Amendment, needs ratification by one more state to meet the Constitutional requirement for approval by three-quarters of the states (38 of the 50 states). The program meetings are now being held at the Walnut Bowling Alley (north door). Read the Nov. 2018 VOTER newsletter. This issue covers our new city manager, Kendal Francis. Read the Dec. 2018 VOTER newsletter. Learn how Amy Miller, director of County Emergency Management Services, helps to coordinate local disaster responses. Please, read the League Alert regarding the first federal house bill HR1. It includes comprehensive voting reforms! 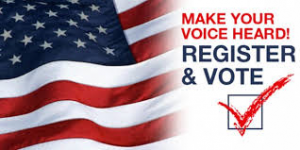 Read the Jan. 2019 VOTER newsletter.